Although it is the most common language in the world, 1 in 10 American public school students (approximately 5,000,000) are currently learning how to speak English. 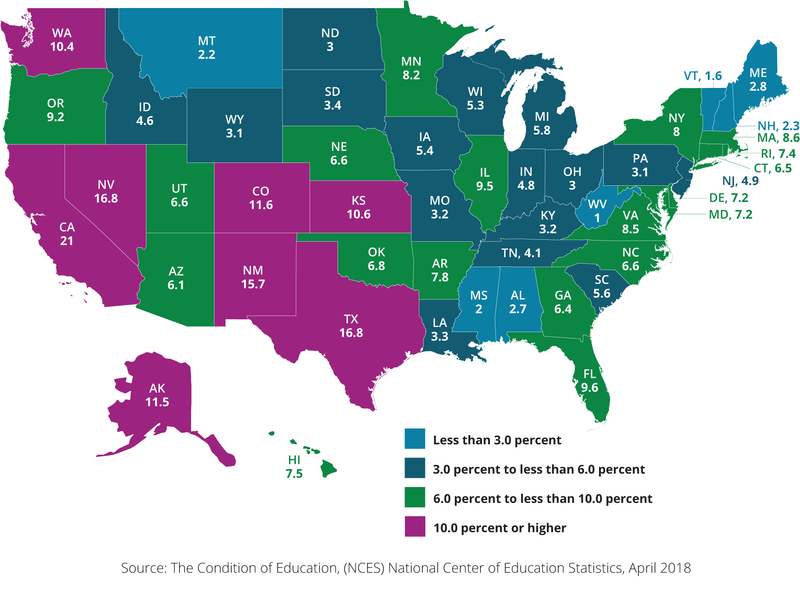 While California is home to 29% of the ELLs nationwide, access to timely English instruction is sparse regardless of what state they live in, and as many as 500,000 aren’t receiving any English instruction at all. This map depicts the ELL landscape in America―what percentage of the population in your state are English language learners? Despite a concerted effort to develop ELL programs in our schools, these students are still lagging behind their peers academically. Recent studies have shown that only 63% of them graduate as opposed to 82% of students who speak fluent English—with some states drastically lower. There is also a huge disparity in the number of ELLs in gifted programs—2% vs. 7.3%—despite evidence that demonstrates an academic benefit to these students being immersed in a more challenging curriculum. Put the keys to unlocking their own potential directly into the hands of your ELLs! The key to these students reaching their full potential is early intervention, part of which includes assessing the four key domains of language—listening, speaking, reading, and writing. The results of these tests help teachers and specialists personalize their education plan and tailor interventions. To learn more, visit PearsonTELL.com or complete the form to request more information.